Although consumer and community engagement (CCE) in health care is receiving increasing attention, research and practice in this area are hampered by the variability of concepts and terminology commonly employed. This scoping meta-review aims to identify key CCE concepts and examine terminology used to describe them. In a scoping meta-review, an extensive list of 47 phrases and 11 Medical Subject Headings (MeSH) was used to undertake a comprehensive and systematic search in PubMed Central, Embase, EBM reviews, CINAHL, APAPsycNET, and Scopus. 59 systematic reviews met the selection criteria and were included in the final analysis. The analysis identified nine different concepts related to CCE: shared decision making, self-management, CCE in health care systems, community-based health promotion, providing access to health care, rehabilitation, participation in research, collaboration in research design and conduct, and peer support. The identified concepts differ from each other in many aspects including the aim of the activity, the role of consumers and the type of professionals’ involvement. Each concept was described by a range of terms, with some terms shared by different concepts. In addition, two overlapping concepts of patient-centeredness and patient empowerment were recognised. This study describes CCE-related key concepts and provides new insight into their relationship with different CCE-related terms. Identification of key CCE-related concepts and terms will be useful to focus future studies and initiatives and enhance production of CCE-related evidence. Policy-makers, researchers and the public have paid growing attention to the role of consumer and community engagement (CCE) in health care over the last decade . Yet there is no single, agreed definition of CCE. CCE can occur in different fields and for a variety of purposes. The relationship between consumers and community members with health care systems is diverse. Szasz and Hollender  identify three roles that patients might adopt in their relationship with clinicians: recipients, co-operators, and active participants. Bowen et al. have suggested a ‘continuum of community engagement’ in which engagement of the community has three potential stages in which the community adopts: a passive role primarily receiving information; a more active but still predominantly recipient role; and shared decision making role with more or less equal positioning. In addition, it seems that a set of overlapping terms is used to signify all or parts of the same core concept of CCE. This exemplifies the arbitrary relationship between words and underlying concepts suggested by De Saussure . CCE is referred to using terms including ‘shared decision making (SDM)’, ‘patient participation’, and ‘community engagement’, amongst numerous others. Several authors have identified that the use of mutual terminology for disparate activities can lead to controversy [5–9]. This is one of the reasons why providing an evidence base for the efficacy of CCE has remained a challenge. While the principle of CCE is gaining momentum in health systems across the world, evidence for its effectiveness in improving patient outcomes and its cost effectiveness remains relatively weak [1, 10–13]. This scoping meta-review aims to identify different CCE-related concepts and examine the terminology used to describe those concepts. This study is based on an innovative method, scoping meta-review, which combines scoping review and meta-review methods. A scoping review is an emerging literature review methodology that is useful to map out a field of interest [14, 15]. This method can be used as a transparent technique to map the literature and address broad research questions on a topic . Meta-reviews refer to activities which synthesise evidence from an overview of systematic reviews . We used scoping review methodology to overview CCE-related systematic reviews. The appropriateness of this method was identified based on a non-systematic preliminary review that indicated that the field is diverse and complex. Therefore we needed a scoping review methodology to map CCE-related concepts. In addition, based on the preliminary review, we noted that there were many systematic reviews on various aspects of CCE. Therefore, it was feasible to undertake a scoping overview of existing systematic reviews on CCE in health care. The advantage of relying on systematic reviews was the possibility of presenting a robust and reliable picture of the field. Each paper included using this method is a systematic review that has appraised a number of studies. Furthermore, systematic reviews present their search terms, which is particularly relevant to the aim of a study exploring various CCE-related phrases. In conducting the preliminary review, we identified a comprehensive list of nine medical subject headings (MeSH) and 47 phrases search terms (see Additional file 1). The extensive list was used to ensure our sample would include various types of CCE-related concepts. We searched six major databases in health care and medicine: PubMed Central; Embase, EBM reviews; CINAHL; APAPsycNET; and Scopus. Systematic reviews examining CCE in health care were included, incorporating all health care clients irrespective of the health care problem. Citations were downloaded into EndNote X5, a bibliographic database. This software assisted management of our review, including identification of duplications, browsing titles and abstracts, and saving the review results. The search excluded: studies presenting data from a single study, opinions, books, chapters, discussions, and letters and publications in languages other than English. No geographical restrictions were placed on the citations. Initially no time limit was considered. However, following the identification of 2,159 citations for interrogation, the search strategy was revised in order to obtain a more manageable sample. The revised search strategy included only those systematic reviews published between January 2010 and October 2011. Revising the search strategy is an acceptable step in a scoping review  and as each systematic review examines published studies from previous years, we were able to indirectly access studies published prior to 2010. The first author screened the abstracts against the selection criteria. Irrelevant references were excluded on the basis of the relevance of their title and abstract. The full text was obtained for the remaining references and evaluated against the selection criteria by the first and second author. Papers were excluded if they were not related to CCE or if they were not systematic reviews. An appraisal tool developed by the Public Health Resource Unit, England was consulted to decide whether papers fulfilled the criteria of a systematic review . Data analysis involved several steps. Following a close reading of the selected papers, each paper was allocated to an emerging category of CCE-related concepts. After identifying all emergent categories of CCE-related concepts and allocating all of the selected papers to a category, phrases that were used to describe each concept were identified. At this point, a table of CCE-related concepts was created. We used Cytoscape software, to produce a visual representation of the complex relationship between phrases and concepts (Figure 1). Relationship between CCE-related concepts and related phrases. Concepts are labelled in circles with bold font, which are connected to the related phrases illustrated by squares. Phrases are labelled only if they are shared by three or more concepts. This Figure is illustrating the overlaps between phrases for different concepts, and also it illustrates that each concept is described by different phrases. The results of the scoping meta-review are illustrated in Figure 2. Initially our search across the academic literature data bases identified 10,078 references. Following removal of 3,044 duplicates, 7,034 references remained. These references were evaluated according to their titles and abstracts and 4,875 papers were excluded based on their topic or method. In the next stage, 1,993 papers published before 2010 were excluded. There were 166 papers included for full text review. During the final stage, 107 papers were excluded based on topic relevance or methodology. There were 59 papers remaining that were analysed and evaluated. 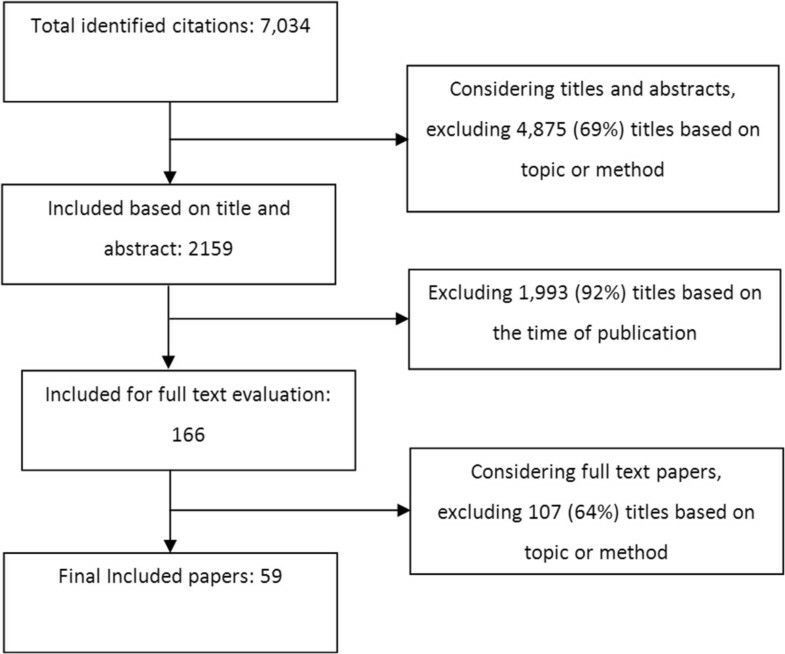 Based on the analysis of the included systematic reviews (n = 59), nine different categories of concepts emerged (Table 1). These concepts refer to different types of CCE-related activities, processes or mechanisms; they involve different types of health care professionals and have different aims; and they also present different types of roles for consumers and community members (Table 1). Shared Decision Making (SDM) is hypothesised to promote active consumer involvement in health-related decisions . As a concept it refers to a style of communication between a patient and clinician which aims to place patients’ preferences and values on a level comparable, although not the same as, clinical information . The aim of SDM is to achieve positive outcomes for patients’ communication between the clinician and patient and helping patients to select better treatment options . However, systematic reviews included in this study identified that evidence for SDM is mixed  and that SDM faces a number of challenges. For example, patients’ actual participation in SDM might be less than they prefer [20–22] and health care professionals may need guidance on how to implement SDM . One systematic review reported that SDM had no effect on clinical outcomes in mental health . Self-management is undertaken by educating, supporting and encouraging patients to adopt an active role in their own health management [24–26]. Self-management is particularly relevant to patients affected by chronic diseases such as diabetes . CCE in health care systems refers to involvement of citizens in the design of health care policies, service delivery or interventions. This may include, for example, the design and introduction of new technologies in health care [28, 29]. Both patients and members of the general public can be involved in health care systems. However, Menon et al. have noted that individual patients’ opinions about an approach may differ to those of the general public and it is therefore necessary to distinguish between the participant groups and to be transparent about whether the opinion of public or patients has been obtained . Community-based health promotions refer to the communities’ participation in actions and activities that improve the health of, and reduce risks to, those communities. Community members might, for example, be encouraged to participate in more physical activities to improve their wellbeing [30, 31] or to participate in notification and control of infections [32, 33]. More information is needed to support the efficacy of current approaches in increasing community participation . We identified some phrases such as ‘community engagement’ or ‘patient participation’ that are used to describe provision of access to health care. Related systematic reviews described strategies employed to facilitate access to specific health care services, or the strategies employed to increase the use of health services by particular groups or individuals. For example, telemedicine has been used as a mechanism to increase the public’s access to health care ; or community reinforcement and family training have been used to engage treatment-resistant patients with substance abuse problems . In contrast with SDM, the main intention of ‘providing access to health care’ is to provide health care, not necessarily an active involvement in decision making and health care. We identified that phrases such as ‘patient participation’ are used to describe rehabilitation of patients with limited mobility, such as stroke patients. The aim of ‘patient participation’ in this context is to increase patients’ participation in social activities [7, 36] and participation is an index of patients’ health and rehabilitation . It is worth noting that systematic reviews included in this study referred to difficulties in the definition and conceptualisation of ‘participation’ [6–8]. Phrases such as ‘consumer participation’ might seem to denote active involvement of patients in research. However, we identified that in some systematic reviews, ‘participation in research’ referred to recruitment of consumers and community members into research projects as passive participants and subjects of a study. These systematic reviews explored studies that aimed to enhance recruitment and retention of people with a specific health condition, age, or from a particular ethnic group into clinical research [37–40]. In contrast to the previous concept, consumers and community members may be invited to actively collaborate in the design and conduct of research [41, 42]. Within this domain, members of the public and patients are engaged with the research process in a variety of ways ranging from participation in ethics committees, through to roles on community advisory boards and to undertaking an active role as a co-investigators . Members of the public actively contributing to research may be involved in: defining the scope of the study; recommending, identifying and evaluating the relevant literature; interpreting the findings; checking the consent processes and information sheets; examining the data collection processes; writing up the results; and reviewing outcome recommendations [44, 45]. Peer support refers to patients undertaking an active role in educating or providing care and treatment for other patients [46–49]. According to the included systematic reviews, this approach has been shown to be a successful mechanism for patient education and can contribute to changes in consumer and community members’ knowledge and norms [47, 50]. Several challenges for this approach have been identified. More research is needed on consumer-led services . Consumers providing peer support require training, supervision, and management . More funding would be required to meet these challenges . The first stage of the analysis included identifying different CCE-related concepts. In the next stage of the analysis, we explored phrases that were used to describe those concepts. We identified that each concept is described with a range of different phrases (Table 1). We undertook a network analysis of the concepts and related phrases and identified that despite the differences between various aspects of the concepts, similar phrases are used to describe them. 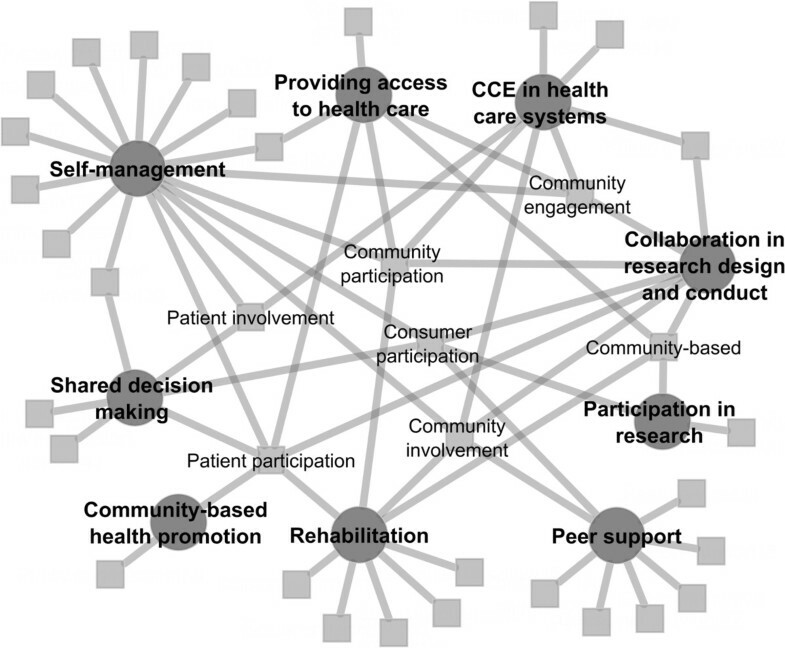 For example, as illustrated in Figure 1, systematic reviews included in this study used ‘community engagement’ to describe ‘self-management’, ‘providing access to health care’, ‘CCE in health care systems’ and ‘collaboration in research design and conduct’. As expected the concepts that emerged in our study include activities, processes, and mechanisms that were described by one of our search terms (e.g. consumer engagement or patient participation). Our analysis also identified two additional concepts, patient-centeredness and patient-empowerment, that are not described by any of the search terms we used. Significantly, these concepts are highly related to and overlap with the concept of CCE in the systematic reviews analysed in this study. Patient-centeredness or patient-centred care implies putting the patients’ needs and experiences as the first priority and at the heart of care. This includes considering patients’ psychological needs and engaging with patients’ life experience [53, 54]. Patient-centeredness can incorporate the encouragement of patients’ participation in their health care and related decisions, as discussed in SDM . However, patient-centeredness is not equal to SDM and is a broader approach focusing on the clinicians’ and services’ relationship with and stance towards patients, as well as the patients’ involvement in services. Patient empowerment implies improving patients’ knowledge, control of and impact on their own health care [56, 57]. Empowerment is defined in a variety of ways, such as supporting patient autonomy, and choice . Therefore, this concept is closely related to other CCE-related concepts such as SDM, self-management and CCE in health care systems. CCE is not defined uniformly and it does not incorporate a single concept and type of activity. This scoping meta-review identifies nine different CCE-related concepts that are described by assorted terms. Definitions of CCE may incorporate differing combinations of these concepts. That is, the relevance of some of the concepts will be determined by how CCE is defined. For example, this study identified ‘rehabilitation’ as a concept related to CCE, because it was described by phrases such as ‘patient participation’ (here ‘patient participation’ was used to describe participation of patients in normal social activities). However, if CCE is defined as the active involvement of patients and community members in health care, this definition will not necessarily involve participation of patients in social activities. The use of the same CCE-related terms to describe different concepts can lead to confusion and miscommunication. Identification of these various concepts described in this paper will be helpful for practitioners, researchers and policy-makers. They can be transparent on the range of concepts that are included in the definition of CCE they are adopting or creating. It is notable that the identified concepts can be seen to be related to a particular group of health care professionals. For clinicians and health providers, SDM, self-management, rehabilitation and ‘peer support’ are the relevant concepts. Those who work in health care organisations, such as health policy-makers, might wish to advocate all concepts, but ‘CCE in health care systems’, ‘community-based health promotion’, and ‘providing access to health care’ are core to their direct responsibilities. Finally, ‘participation in research’ and ‘collaboration in research design and conduct’ are more squarely related to researchers and academics. This is not, of course, an exclusive categorisation. Any practitioner or policy-maker might deal with any concept introduced in this paper. But we suggest that having this map may assist interested parties to be fully aware of the range of possibilities and types of CCE-related activities and mechanisms. Although the identified concepts vary considerably in their aims (i.e. improving one’s own health versus improving health in general), participants (e.g. clinicians, researchers or policy-makers) and locations (e.g. health care centres, universities, and health organisations), the majority of these concepts are directed at expanding the role(s) consumers and community members undertake in health care (Table 1). As such they redress a more historical approach where patients are expected to be recipients of health care, rather than being active players within it . CCE can therefore be viewed as presenting a change in historical focus of health care and a challenge in health care settings . Other authors have indicated that concepts and terms underpinning CCE such as engagement, participation, empowerment, and involvement are interpreted differently and are not defined alike [22, 41, 60]. This may explain the finding of this study that some phrases like ‘community engagement’ are shared by different concepts and as such become umbrella terms [29, 60]. Despite the large volume of evidence that exists in relation to CCE, according to the included systematic reviews, there is a shortage of high quality evidence to support CCE-related concepts. We propose that as long as these activities are referred to with wide, umbrella phrases, this uncertainty and complexity will continue. Supporting evidence for ‘community engagement’, for example, is meaningless unless the intended concept is specified. In addition, it might be interesting to debate over various phrases used and to discuss which is the most relevant phrase to utilise. A consensus-building study or process can be attempted to achieve agreement over a universally used technical term. The framework of nine different concepts and their related phrases may be helpful in this process. However, while this has not yet been achieved, it will be crucial over time to be transparent on the concepts intended by chosen phrases. For example, one may select the phrase of ‘patient participation’, and be transparent by indicating that this includes only SDM and self-management. Previous attempts to overcome complexities in this field involved classifying activities. Bowen et al. , for example, introduce a ‘continuum of community engagement’ and divided engagement strategies into three categories: ‘transactional, transitional, and transformational engagement’. Another framework provided by Mittler et al. emphasises differentiation of engaged behaviours and activation (the motivation for engaged behaviours). The authors of the current study have also introduced a model that identifies eight key elements for planning for CCE. These elements are: identification of aims; type of activity; participants; preparedness; method of engagement; measurement method; barriers; and facilitators . The scoping meta-review identifies and details types of CCE-related concepts thereby facilitating the application of CCE models. We have selected and explored a sample of academic papers, which did not directly include non-systematic reviews and grey literature. In addition, despite our efforts to include a wide range of papers by utilising an extensive list of 47 search phrases, there might be other CCE-related concepts that are not identified in this paper. Finally, qualitative analysis of concepts and phrases is inevitably a subjective process. Future work should examine this framework and attempt further refinement of CCE-related concepts. This scoping meta-review provides new insights into the relationship of phrases and concepts related to the field of CCE in health care. By identifying the specific concepts related to CCE, this study can assist more focused evaluations of the current evidence, and more importantly, enhance the production of new evidence. PSF is a medical sociologist with a doctoral degree in medicine and a PhD in sociology. His broad expertise includes the study of social aspects of health and medicine for more than a decade. He has extensive international research expertise and has worked in Iran, the United Kingdom and Australia focusing on consumer and community engagement, clinical variation, and mental health. He is active in supervising postgraduate students undertaking research on consumer and community engagement in health care at UNSW. JT has been involved in health services education and research for over 20 years, actively inquiring into and promoting and developing the fields of diversity, patient safety and inter-professional learning and practice across the Australian and Italian health systems. She has led research and evaluation projects on a range of topics relating to patient safety, the quality and equity of service provision in aged and health care, communication, collaboration, peer support, diversity, ethnicity, cultural competence, disability and inter-professionalism. Dr Travaglia worked most recently in the Centre on an evaluation of inter-professional practice and learning across an entire health system, and currently works on projects concerning consumer engagement, vulnerability, patient safety, and comparative international health systems studies. DD is a research officer in the Centre for Clinical Governance Research. She is a registered nurse and midwife with experience in both rural and metropolitan acute care settings. Ms Debono graduated with a Bachelor of Arts degree majoring in Psychology and Sociology. Her Honours Thesis investigated automatic and controlled cognitive processing in the elderly and her research interests are medication error, patient safety and workarounds. Ms Debono is conducting projects and providing research support in a range of areas and is undertaking a PhD focusing on workarounds in health care. JB is a leading health services researcher known internationally for his work investigating the culture and structure of acute settings, leadership, management and change in health sector organisations, quality and safety in health care, accreditation and surveying processes in an international context and the restructuring of health services. Professor Braithwaite has published extensively (more than 300 refereed contributions, and 500 total publications) about organisational, social and team approaches to care which has raised the importance of these both here and internationally. Theories and ideas he has helped shape, formulate or devise, and provided research findings for, are now in common use: multi-method, triangulated approaches to research, the boundary-less hospital, accreditation models in general practice and beyond, clinician-managers as key players in reform initiatives, fundamental principles for the governance of health systems, diversity in clinical professional groups, and inter-professional learning and culture change rather than restructuring as a more sustainable strategy for reform. The preliminary review and the scoping meta-review were undertaken as a part of the Community Engagement Research Project (CERP), which is a joint project of the Agency for Clinical Innovation (ACI) and the Australian Institute of Health Innovation (AIHI), the University of New South Wales (UNSW). The authors acknowledge Dr Adam Dunn for producing Figure 1.